Buy any of our Deli Specials from our Coffee Shop Menu, with a Sticky toffee pudding dessert AND get a free glass of wine. Offer available at both the Corbridge and Morpeth branch, go to the bottom of the page to claim this offer! Welcome to The Corbridge Larder Delicatessen, buy groceries online, buy hampers online, order fine food from our online deli or visit the foodie mecca situated in the heart of historic Corbridge or our new store in The Sanderson Arcade Morpeth. We have a fantastic range of fine food in our online deli buy: wine, beer, hampers, cheese, chutney, jam, tea, coffee, cereals, oils and food gifts. 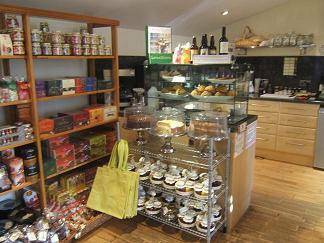 In the modern supermarket age, the Corbridge Larder Deli and Coffee shop stands for good old fashioned value, the quality of our food is the key to our success. We have a huge range of quality fine food, which covers the entire spectrum of culinary delights. Our coffee shop only showcases the products we sell: homemade pies, quiches and tarts, Italian antipasto, Greek meze and fine cheese from our award winning cheese shop. And a great cup of coffee!